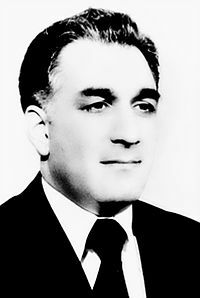 Hafizullah Amin (Pashto/Dari: حفيظ الله امين‎; born 1 August 1929 – 27 December 1979) was an Afghan communist politician during the Cold War. Amin was born in Paghman and educated at Kabul University, after which he started his career as a teacher. After a few years in that occupation, he went to the United States to study. He would visit the United States a second time before moving permanently to Afghanistan, and starting his career in radical politics. He ran as a candidate in the 1965 parliamentary election but failed to secure a seat. Amin was the only Khalqist elected to parliament in the 1969 parliamentary election, thus increasing his standing within the party. He was one of the leading organizers of the Saur Revolution which overthrew the government of Mohammad Daoud Khan. In 1979 he named himself president, prime minister, and chairman of the Khalq wing. He has been described as "ruthless" and a "radical Marxist". Amin's short-lived presidency was marked by controversies from beginning to end. He came to power by disposing of his predecessor Nur Muhammad Taraki and later ordering his death. Amin made attempts to win support from those who revolted against the communist regime which had begun under Taraki, but his government was unable to solve this problem. Many Afghans held Amin responsible for the regime's harshest measures, such as ordering thousands of executions. Thousands of people disappeared without trace during his time in office. The Soviet Union, which was dissatisfied with Amin, intervened in Afghanistan while invoking the Twenty-Year Treaty of Friendship between Afghanistan and the Soviet Union. Amin was assassinated by the Soviets on December 27, 1979 as part of Operation Storm-333, having ruled for slightly longer than three months. Hafizullah Amin was born to a Ghilzai Pashtun family in the Qazi Ghel village in Paghman on 1 August 1929. His father, a civil servant, died when he was still very young. Thanks to his brother Abdullah, a primary school teacher, Amin was able to attend both primary and secondary school, which in turn allowed him to attend Kabul University (KU). After studying mathematics there, he also graduated from the Darul Mualimeen Teachers College in Kabul, and became a teacher. Amin later became vice-principal of the Darul Mualimeen College, and then principal of the prestigious Avesina High School, and in 1957 left Afghanistan for Columbia University in New York City, where he earned M. A. in education. It was at Columbia that Amin became attracted to Marxism, and in 1958 he became a member of the university's Socialist Progressive Club. When he returned to Afghanistan, Amin became a teacher at Kabul University, and later, for the second time, the principal of Avesina High School. During this period Amin became acquainted with Nur Muhammad Taraki, a communist. Around this time, Amin quit his position as principal of Avesina High School in order to become principal of the Darul Mualimeen College. It is alleged that Amin became radicalised during his second stay in the United States in 1962, when he enrolled in a work-study group at the University of Wisconsin. Amin studied in the doctoral programme at the Columbia University Teachers College, but started to neglect his studies in favour of politics; in 1963 he became head of the Afghan students' association at the college. When he returned to Afghanistan in the mid-1960s, the route flew to Afghanistan by way of Moscow. There, Amin met the Afghan ambassador to the Soviet Union, his old friend Ali Ahmad Popel, a previous Afghan Minister of Education. During his short stay, Amin became even more radicalised. Some people, Nabi Misdaq for instance, do not believe he travelled through Moscow, but rather West Germany and Lebanon. By the time he had returned to Afghanistan, the Communist People's Democratic Party of Afghanistan (PDPA) had already held its founding congress, which was in 1965. Amin ran as a candidate for the PDPA in the 1965 parliamentary election, and lost by a margin of less than fifty votes. In 1966, when the PDPA Central Committee was expanded, Amin was elected as a non-voting member, and in the spring of 1967 he gained full membership. Amin's standing in the Khalq faction of the PDPA increased when he was the only Khalqist elected to parliament in the 1969 parliamentary election. When the PDPA split along factional lines in 1967, between Khalqists led by Nur and Parchamites led by Babrak Karmal, Amin joined the Khalqists. As a member of parliament, Amin tried to win over support from the Pashtun people in the armed forces. According to a biography about Amin, he used his position as member of parliament to fight against imperialism, feudalism, and reactionary tendencies, and fought against the "rotten" regime, the monarchy. Amin himself said that he used his membership in parliament to pursue the class struggle against the bourgeoisie. Relations between Khalqists and Parchamites deteriorated during this period. Amin, the only Khalq member of parliament, and Babrak Karmal, the only Parcham member of parliament, did not cooperate with each other. Amin would later, during his short stint in power, mention these events with bitterness. Following the arrest of fellow PDPA members Dastagir Panjsheri and Saleh Mohammad Zeary in 1969, Amin became one of the party's leading members, and was still a pre-eminent party member by the time of their release in 1973. From 1973 until the PDPA unification in 1977, Amin was second only to Taraki in the Khalqist PDPA. When the PDPA ruled Afghanistan, their relationship was referred to as a disciple (Amin) following his mentor (Taraki). This official portrayal of the situation was misleading; their relationship was more work-oriented. Taraki needed Amin's "tactical and strategic talents"; Amin's motivations are more uncertain, but it is commonly believed that he associated with Taraki to protect his own position. Amin had attracted many enemies during his career, the most notable being Karmal. According to the official version of events, Taraki protected Amin from party members or others who wanted to hurt the PDPA and the country. When Mohammed Daoud Khan ousted the monarchy, and established the Republic of Afghanistan, the Khalqist PDPA offered its support for the new regime if it established a National Front which presumably included the Khalqist PDPA itself. The Parchamite PDPA had already established an alliance with Daoud at the beginning of his regime, and Karmal called for the dissolution of the Khalqist PDPA. Karmal's call for dissolution only worsened relations between the Khalqist and Parchamite PDPA. However, Taraki and Amin were lucky; Karmal's alliance actually hurt the Parchamites' standing in Afghan politics. Some communists in the armed forces became disillusioned with the government of Daoud, and turned to the Khalqist PDPA because of its apparent independence. Parchamite association with the Daoud government indirectly led to the Khalqist-led PDPA coup of 1978, popularly referred to as the Saur Revolution. From 1973 until the 1978 coup, Amin was responsible for organising party work in the Afghan armed forces. According to the official version, Amin "met patriotic liaison officers day or night, in the desert or the mountains, in the fields or the forests, enlightening them on the basis of the principles of the working class ideology." Amin's success in recruiting military officers lay in the fact that Daoud "betrayed the left" soon after taking power. When Amin began recruiting military officers for the PDPA, it was not difficult for him to find disgruntled military officers. In the meantime, relations between the Parchamite and Khalqist PDPA deteriorated; in 1973 it was rumoured that Major Zia Mohammadzai, a Parchamite and head of the Republican Guard, planned to assassinate the entire Khalqist leadership. The plan, if true, failed because the Khalqists found out about it. The assassination attempt proved to be a further blow to relations between the Parchamites and Khalqists. The Parchamites deny that they ever planned to assassinate the Khalqist leadership, but historian Beverley Male argues that Karmal's subsequent activities give credence to the Khalqist view of events. Because of the Parchamite assassination attempt, Amin pressed the Khalqist PDPA to seize power in 1976 by ousting Daoud. The majority of the PDPA leadership voted against such a move. The following year, in 1977, the Parchamites and Khalqists officially reconciled, and the PDPA was unified. The Parchamite and Khalqist PDPAs, which had separate general secretaries, politburos, central committees and other organisational structures, were officially unified in the summer of 1977. One reason for unification was that the international communist movement, represented by the Communist Party of India, Iraqi Communist Party and the Communist Party of Australia, called for party unification. On 18 April 1978 Mir Akbar Khyber, the chief ideologue of the Parcham faction, was killed; he was commonly believed to have been assassinated by the Daoud government. Khyber's assassination initiated a chain of events which led to the PDPA taking power eleven days later, on 27 April. The assassin was never caught, but Anahita Ratebzad, a Parchamite, believed that Amin had ordered the assassination. Khyber's funeral evolved into a large anti-government demonstration. Daoud, who did not understand the significance of the events, began a mass arrest of PDPA members seven days after Khyber's funeral. Amin, who organised the subsequent revolution against Daoud, was one of the last Central Committee members to be arrested by the authorities. His late arrest can be considered as proof of the regime's lack of information; Amin was the leading revolutionary party organiser. The government's lack of awareness was proven by the arrest of Taraki – Taraki's arrest was the pre-arranged signal for the revolution to commence. When Amin found out that Taraki had been arrested, he ordered the revolution to begin at 9am on 27 April. Amin, in contrast to Taraki, was not imprisoned, but instead put under house arrest. His son, Abdur Rahman, was still allowed freedom of movement. The revolution was successful, thanks to overwhelming support from the Afghan military; for instance, it was supported by Defence Minister Ghulam Haidar Rasuli, Aslam Watanjar the commander of the ground forces, and the Chief of Staff of the Afghan Air Force, Abdul Qadir. After the Saur revolution, Taraki was appointed Chairman of the Presidium of the Revolutionary Council and Chairman of the Council of Ministers, and retained his post as PDPA general secretary. Taraki initially formed a government which consisted of both Khalqists and Parchamites; Karmal became Deputy Chairman of the Revolutionary Council while Amin became Minister of Foreign Affairs and a Deputy Prime Minister, and Mohammad Aslam Watanjar became a Deputy Prime Minister. The two Parchamites Abdul Qadir and Mohammad Rafi became Minister of National Defence and Minister of Public Works respectively. According to Angel Rasanayagam, the appointment of Amin, Karmal and Watanjar as Deputy Prime Ministers led to the establishment of three cabinets; the Khalqists were answerable to Amin, the Parchamites were answerable to Karmal, and the military officers (who were Parchamites) were answerable to Watanjar. The first conflict between the Khalqists and Parchamites arose when the Khalqists wanted to give PDPA Central Committee membership to the military officers who participated in the Saur Revolution. Amin, who had previously opposed the appointment of military officers to the PDPA leadership, switched sides; he now supported their elevation. The PDPA Politburo voted in favour of giving membership to the military officers; the victors (the Khalqists) portrayed the Parchamites as opportunists, implying that the Parchamites had ridden the revolutionary wave, but not actually participated in the revolution. To make matters worse for the Parchamites, the term Parcham was, according to Taraki, a word synonymous with factionalism. On 27 June 1978, three months after the revolution, Amin managed to outmaneuver the Parchamites at a Central Committee meeting. The meeting decided that the Khalqists had exclusive rights to formulate and decide policy, a policy which left the Parchamites impotent. Karmal was exiled, but was able to establish a network with the remaining Parchamites in government. A coup to overthrow Amin was planned for September. Its leading members in Afghanistan were Qadir, the defence minister, and Army Chief of Staff General Shahpur Ahmedzai. The coup was planned for 4 September, on the Festival of Eid, because soldiers and officers would be off duty. The conspiracy failed when the Afghan ambassador to India told the Afghan leadership about the plan. A purge was initiated, and Parchamite ambassadors were recalled; few returned, for example Karmal and Mohammad Najibullah both stayed in their assigned countries. The Afghan people revolted against the PDPA government when the government introduced several socialist reforms, including land reforms. By early 1979, twenty-five out of Afghanistan's twenty-eight provinces were unsafe because of armed resistance against the government. On 29 March 1979, the Herat uprising began; the uprising turned the revolt into an open war between the Mujahideen and the Afghan government. It was during this period that Amin became Kabul's strongman. Shortly after the Herat uprising had been crushed, the Revolutionary Council convened to ratify the new Five-Year Plan, the Afghan–Soviet Friendship Treaty, and to vote on whether or not to reorganise the cabinet and to enhance the power of the executive (the Chairman of the Revolutionary Council). While the official version of events said that all issues were voted on democratically at the meeting, the Revolutionary Council held another meeting the following day to ratify the new Five-Year Plan and to discuss the reorganisation of the cabinet. Alexander Puzanov, the Soviet ambassador to Afghanistan, was able to persuade Aslam Watanjar, Sayed Mohammad Gulabzoy and Sherjan Mazdoryar to become part of a conspiracy against Amin. These three men put pressure on Taraki, who by this time believed that "he really was the 'great leader'", to sack Amin from office. It is unknown if Amin knew anything about the conspiracy against him, but it was after the cabinet reorganisation that he talked about his dissatisfaction. On 26 March the PDPA Politburo and the Council of Ministers approved the extension of the powers of the executive branch, and the establishment of the Homeland Higher Defence Council (HHDC) to handle security matters. Many analysts of the day regarded Amin's appointment as Prime Minister as an increase in his powers at the expense of Taraki. However, the reorganisation of the cabinet and the strengthening of Taraki's position as Chairman of the Revolutionary Council, had reduced the authority of the Prime Minister. The Prime Minister was, due to the strengthening of the executive, now appointed by the Chairman of the Revolutionary Council. While Amin could appoint and dismiss new ministers, he needed Taraki's consent to actually do so. Another problem for Amin was that while the Council of Ministers was responsible to the Revolutionary Council and its chairman, individual ministers were only responsible to Taraki. When Amin became Prime Minister, he was responsible for planning, finance and budgetary matters, the conduct of foreign policy, and for order and security. The order and security responsibilities had been taken over by the HHDC, which was chaired by Taraki. While Amin was HHDC Deputy Chairman, the majority of HHDC members were members of the anti-Amin faction. For instance, the HHDC membership included Watanjar the Minister of National Defence, Interior Minister Mazdoryar, the President of the Political Affairs of the Armed Forces Mohammad Iqbal, Mohammad Yaqub, the Chief of the General Staff, the Commander of the Afghan Air Force Nazar Mohammad and Assadullah Sarwari the head of ASGA, the Afghan secret police. The order of precedence had been institutionalised, whereby Taraki was responsible for defence and Amin responsible for assisting Taraki in defence related matters. Amin's position was given a further blow by the democratisation of the decision-making process, which allowed its members to contribute; most of them were against Amin. Another problem for Amin was that the office of HHDC Deputy Chairman had no specific functions or powers, and the appointment of a new defence minister who opposed him drastically weakened his control over the Ministry of National Defence. The reorganisation of ministers was a further blow to Amin's position; he had lost control of the defence ministry, the interior ministry and the ASGA. Amin still had allies at the top, many of them in strategically important positions, for instance, Yaqub was his brother-in-law and the Security Chief in the Ministry of Interior was Sayed Daoud Taroon, who was also later appointed to the HHDC as an ordinary member in April. Amin succeeded in appointing two more of his allies to important positions; Mohammad Sediq Alemyar as Minister of Planning and Khayal Mohammad Katawazi as Minister of Information and Culture; and Faqir Mohammad Faqir was appointed Deputy Prime Minister in April 1978. Amin's political position was not secure when Alexei Yepishev, the Head of the Main Political Directorate of the Soviet Army and Navy, visited Kabul. Yepishev met personally with Taraki on 7 April, but never met with Amin. The Soviets were becoming increasingly worried about Amin's control over the Afghan military. Even so, during Yepishev's visit Amin's position was actually strengthened; Taroon was appointed Taraki's aide-de-camp. Soon after, at two cabinet meetings, the strengthening of the executive powers of the Chairman of the Revolutionary Council was proven. Even though Amin was Prime Minister, Taraki chaired the meetings instead of him. Amin's presence at these two meetings was not mentioned at all, and it was made clear that Taraki, through his office as Chairman of the Revolutionary Council, also chaired the Council of Ministers. Another problem facing Amin was Taraki's policy of autocracy; he tried to deprive the PDPA Politburo of its powers as a party and state decision-making organ. The situation deteriorated when Amin personally warned Taraki that "the prestige and popularity of leaders among the people has no common aspect with a personality cult." Factionalism within the PDPA made it ill-prepared to handle the intensified counter-revolutionary activities in the country. Amin tried to win support for the communist government by depicting himself as a devout Muslim. Taraki and Amin blamed different countries for helping the counter-revolutionaries; Amin attacked the United Kingdom and the British Broadcasting Corporation (BBC) and played down American and Chinese involvement, while Taraki blamed American imperialism and Iran and Pakistan for supporting the uprising. Amin's criticism of the United Kingdom and the BBC fed on the traditional anti-British sentiments held by rural Afghans. In contrast to Taraki, "Amin bent over backwards to avoid making hostile reference to", China, the United States or other foreign governments. Amin's cautious behavior was in deep contrast to the Soviet Union's official stance on the situation; it seemed, according to Beverley Male, that the Soviet leadership tried to force a confrontation between Afghanistan and its enemies. Amin also tried to appease the Shia communities by meeting with their leaders; despite this, a section of the Shia leadership called for the continuation of the resistance. Subsequently, a revolt broke out in a Shia populated district in Kabul; this was the first sign of unrest in Kabul since the Saur Revolution. To add to the government's problems, Taraki's ability to lead the country was questioned – he was a heavy drinker and was not in good health. Amin on the other hand was characterised in this period by portrayals of strong self-discipline. In the summer of 1979 Amin began to disassociate himself from Taraki. On 27 June Amin became a member of the PDPA Politburo, the leading decision-making body in Afghanistan. In-mid July the Soviets made their view official when Pravda wrote an article about the situation in Afghanistan; the Soviets did not wish to see Amin become leader of Afghanistan. This triggered a political crisis in Afghanistan, as Amin initiated a policy of extreme repression, which became one of the main reasons for the Soviet intervention later that year. On 28 July, a vote in the PDPA Politburo approved Amin's proposal of creating a collective leadership with collective decision-making; this was a blow to Taraki, and many of his supporters were replaced by pro-Amin PDPA members. Ivan Pavlovsky, the Commander of the Soviet Ground Forces, visited Kabul in mid-August to study the situation in Afghanistan. Amin, in a speech just a few days after Pavlovsky's arrival, said that he wanted closer relations between Afghanistan and the People's Republic of China; in the same speech he hinted that he had reservations about Soviet meddling in Afghanistan. He likened Soviet assistance to Afghanistan with Vladimir Lenin's assistance to the Hungarian Soviet Republic in 1919. Taraki, a delegate to the conference held by the Non-Aligned Movement in Havana, met personally with Andrei Gromyko, the Soviet Minister of Foreign Affairs, to discuss the Afghanistan situation on 9 September. Shah Wali, the Minister of Foreign Affairs, who was a supporter of Amin, did not participate in the meeting. This, according to Beverley Male, "suggested that some plot against Amin was in preparation". Taraki was instructed to stop-over in Moscow, where the Soviet leaders urged him to remove Amin from power as per the KGB's decision, because Amin posed danger. Amin's trusted aid, Daoud Taroon, informed Amin of the meeting and the KGB's plan. In Kabul, Taraki's aides, the Gang of Four (consisting of Watanjar, Mazdoryar, Gulabzoi and Sarwari), planned a plot to assassinate Amin, but it failed as Amin was informed of this. Within hours of Taraki's return to Kabul on 11 September, Taraki convened the cabinet "ostensibly to report on the Havana Summit". Instead of reporting on the summit, Taraki tried to dismiss Amin as Prime Minister. Amin, aware of the murder plot, demanded the Gang of Four to be removed from their posts, but Taraki laughed it off. Taraki sought to neutralise Amin's power and influence by requesting that he serve overseas as an ambassador. Amin turned down the proposal, shouting "You are the one who should quit! Because of drink and old age you have taken leave of your senses." On September 13, Taraki invited Amin to the presidential palace for lunch with him and the Gang of Four. Amin turned down the offer, stating he would prefer their resignation rather than lunching with them. Soviet ambassador Puzanov persuaded Amin to make the visit to the Presidential Palace along with Taroon, the Chief of Police, and Nawab Ali, an intelligence officer. Inside the palace on September 14, bodyguards within the building opened fire on the visitors. Taroon was killed but Amin only sustained an injury and escaped. Amin drove to the Ministry of Defence building, put the Army on high alert and ordered Taraki's arrest. At 6:30pm tanks from the 4th Armoured Corps entered the city and stood at government buildings. Shortly afterwards, Amin returned to the palace with a contingent of Army officers, and placed Taraki under arrest. The Gang of Four, however, had "disappeared" and sought refuge in the Soviet Embassy. After Taraki's arrest, the Soviets tried to rescue Taraki (or, according to other sources, kidnap Amin) via the embassy or Bagram Air Base but the strength of Amin's officers repelled their decision to make a move. Amin was told by the Soviets not to punish Taraki and strip him and his comrades of their positions, but Amin ignored them. Amin reportedly discussed the incident with Leonid Brezhnev, and indirectly asked for the permission to kill Taraki, to which Brezhnev replied that it was his choice. Amin, who now believed he had the full support of the Soviets, ordered the death of Taraki. It is believed Taraki was suffocated with pillows on October 8, 1979. The Afghan media would report that the ailing Taraki had died, omitting any mention of his murder. Taraki's murder shocked and upset Brezhnev. Following Taraki's fall from power, Amin was elected Chairman of the Presidum of the Revolutionary Council and General Secretary of the PDPA Central Committee by the PDPA Politburo. The election of Amin as PDPA General Secretary and the removal of Taraki from all party posts was unanimous. The only members of the cabinet replaced when Amin took power were the Gang of Four – Beverley Male saw this as "a clear indication that he had their [the ministers'] support". Amin's rise to power was followed by a policy of moderation, and attempts to persuade the Afghan people that the regime was not anti-Islamic. Amin's government began to invest in the reconstruction, or reparation, of mosques. He also promised the Afghan people freedom of religion. Religious groups were given copies of the Quran, and Amin began to refer to Allah in speeches. He even claimed that the Saur Revolution was "totally based on the principles of Islam". The campaign proved to be unsuccessful, and many Afghans held Amin responsible for the regime's totalitarian behavior. Amin's rise to power was officially endorsed by the Jamiatul Ulama on 20 September 1979. Their endorsement led to the official announcement that Amin was a pious Muslim – Amin thus scored a point against the counter-revolutionary propaganda which claimed the communist regime was atheist. Amin also tried to increase his popularity with tribal groups, a feat Taraki had been unable or unwilling to achieve. In a speech to tribal elders Amin was defensive about the Western way he dressed; an official biography was published which depicted Amin in traditional Pashtun clothes. During his short stay in power, Amin became committed to establishing a collective leadership; when Taraki was ousted, Amin promised "from now on there will be no one-man government..."
Attempting to pacify the population, Amin released a list of 18,000 people who had been executed, and blamed the executions on Taraki. The total number of arrested during Taraki's and Amin's combined reign number between 17,000 and 45,000. Amin was not liked by the Afghan people. During his rule, opposition to the communist regime increased, and the government lost control of the countryside. The state of the Afghan military deteriorated; due to desertions the number of military personnel in the Afghan army decreased from 100,000 in the immediate aftermath of the Saur Revolution, to somewhere between 50,000 and 70,000. Another problem Amin faced was the KGB's penetration of the PDPA, the military and the government bureaucracy. While Amin's position in Afghanistan was becoming more perilous by the day, his enemies who were exiled in the Soviet Union and the Eastern Bloc were agitating for his removal. Babrak Karmal, the Parchamite leader, met several leading Eastern Bloc figures during this period, and Mohammad Aslam Watanjar, Sayed Mohammad Gulabzoy and Assadullah Sarwari wanted to exact revenge upon Amin. When Amin became leader, he tried to reduce Afghanistan's dependence on the Soviet Union. To accomplish this, he aimed to balance Afghanistan's relations with the Soviet Union by strengthening relations with Pakistan and Iran. The Soviets were concerned when they received reports that Amin had met personally with Gulbuddin Hekmatyar, one of the leading anti-communists in Afghanistan. His general untrustworthiness and his unpopularity amongst Afghans made it more difficult for Amin to find new "foreign patrons". Amin's involvement in the death of Adolph Dubs, the American Ambassador to Afghanistan, strained his relations with the United States. He tried to improve relations by reestablishing contact, met with three different American chargé d'affaires, and was interviewed by an American correspondent. But this did not improve Afghanistan's standing in the eyes of the United States Government. After the third meeting with Amin, J. Bruce Amstutz, the American Ambassador to Afghanistan from 1979 to 1980, believed the wisest thing to do was to maintain "a low profile, trying to avoid issues, and waiting to see what happens". In early December 1979, the Ministry of Foreign Affairs proposed a joint summit meeting between Amin and Muhammad Zia-ul-Haq, the President of Pakistan. The Pakistani Government, accepting a modified version of the offer, agreed to send Agha Shahi, the Pakistani foreign minister, to Kabul for talks. In the meanwhile, the Inter-Services Intelligence (ISI), Pakistani's secret police, continued to train Mujahideen fighters who opposed the communist regime. Contrary to popular belief, the Soviet leadership headed by Leonid Brezhnev, Alexei Kosygin and the Politburo, were not eager to send troops to Afghanistan. The Soviet Politburo decisions were guided by a Special Commission on Afghanistan, which consisted of Yuri Andropov the KGB Chairman, Andrei Gromyko the Minister of Foreign Affairs, Defence Minister Dmitriy Ustinov, and Boris Ponomarev, the head of the International Department of the Central Committee. The Politburo was opposed to the removal of Taraki and his subsequent murder. According to Brezhnev, the General Secretary of the Central Committee of the Communist Party of the Soviet Union, "Events developed so swiftly in Afghanistan that essentially there was little opportunity to somehow interfere in them. Right now our mission is to determine our further actions, so as to preserve our position in Afghanistan and to secure our influence there." Although Afghan–Soviet relations deteriorated during Amin's short stint in power, he was invited on an official visit to Moscow by Alexander Puzanov, the Soviet ambassador to Afghanistan, because of the Soviet leadership's satisfaction with his party and state-building policy. Not everything went as planned, and Andropov talked about "the undesirable turn of events" taking place in Afghanistan under Amin's rule. Andropov also brought up the ongoing political shift in Afghanistan under Amin; the Soviets were afraid that Amin would move Afghanistan's foreign policy from a pro-Soviet position to a pro-United States position. By early-to-mid December 1979, the Soviet leadership had established an alliance with Babrak Karmal and Assadullah Sarwari. Amin kept a portrait of Joseph Stalin on his desk. When Soviet officials criticized him of his brutality, Amin replied "Comrade Stalin showed us how to build socialism in a backward country." As it turned out, the relationship between Puzanov and Amin broke down. Amin started a smear campaign to discredit Puzanov. This in turn led to an assassination attempt against Amin, in which Puzanov participated. The situation was worsened by the KGB accusing Amin of misrepresenting the Soviet position on Afghanistan in the PDPA Central Committee and the Revolutionary Council. The KGB also noted an increase in anti-Soviet agitation by the government during Amin's rule, and harassment against Soviet citizens increased under Amin. A group of senior politicians reported to the Soviet Central Committee that it was necessary to do "everything possible" to prevent a change in political orientation in Afghanistan. However, the Soviet leadership did not advocate intervention at this time, and instead called for increasing its influence in the Amin leadership to expose his "true intentions". A Soviet Politburo assessment referred to Amin as "a power-hungry leader who is distinguished by brutality and treachery". Amongst the many sins they alleged were his "insincerity and duplicity" when dealing with the Soviet Union, creating fictitious accusations against PDPA-members who opposed him, indulging in a policy of nepotism, and his tendency to conduct a more "balanced policy" towards First World countries. According to the former senior Soviet diplomat, Oleg Grinevsky, the KGB was becoming increasingly convinced that Amin couldn't be counted on to effectively deal with the insurgency and preserve the survival of the Afghan Marxist state. By the end of October the Special Commission on Afghanistan, which consisted of Andropov, Gromyko, Ustinov and Ponomarev, wanted to end the impression that the Soviet government supported Amin's leadership and policy. The KGB's First Chief Directorate was put under orders that something had to be done about Afghanistan, and several of its personnel were assembled to deal with the task. Andropov fought hard for Soviet intervention, saying to Brezhnev that Amin's policies had destroyed the military and the government's capabilities to handle the crisis by use of mass repression. The plan, according to Andropov, was to assemble a small force to intervene and remove Amin from power and replace him with Karmal. The Soviet Union declared its plan to intervene in Afghanistan on 12 December 1979, and the Soviet leadership initiated Operation Storm-333 (the first phase of the intervention) on 27 December 1979. Amin trusted the Soviet Union until the very end, despite the deterioration of official relations, and was unaware that the tide in Moscow had turned against him since he ordered Taraki's death. When the Afghan intelligence service handed Amin a report that the Soviet Union would invade the country and topple him, Amin claimed that the report was a product of imperialism. His view can be explained by the fact that the Soviet Union, after several months, finally gave in to Amin's demands and sent troops into Afghanistan to secure the PDPA government. Contrary to common Western belief, Amin was informed of the Soviet decision to send troops into Afghanistan. General Tukharinov, commander of the 40th Army, met with Afghan Major General Babadzhan to talk about Soviet troop movements before the Soviet army's intervention. On 25 December, Dmitry Ustinov issued a formal order, stating that "[t]he state frontier of the Democratic Republic of Afghanistan is to be crossed on the ground and in the air by forces of the 40th Army and the Air Force at 1500 hrs on 25 December". This was the formal beginning of the Soviet intervention in Afghanistan. Concerned for his safety, on 20 December Amin moved from the Presidential Palace, located in the centre of Kabul, to the Tajbeg Palace, which had previously been the headquarters of the Central Army Corps of the Afghan military. The palace was formidable, with walls strong enough to withstand artillery fire. According to Rodric Braithwaite, "its defences had been carefully and intelligently organised". All roads to the palace had been mined, with the exception of one, which had heavy machine guns and artillery positioned to defend it. To make matters worse for the Soviets, the Afghans had established a second line of defence which consisted of seven posts, "each manned by four sentries armed with a machine gun, a mortar, and automatic rifles". The external defences of the palace were handled by the Presidential Guard, which consisted of 2,500 troops and three T-54 tanks. Several Soviet commanders involved in the assassination of Amin thought the plan to attack the palace was "crazy". Although the military had been informed by the Soviet leadership through their commanders, Yuri Drozdov and Vasily Kolesnik, that the president was a "CIA agent" who had betrayed the Saur Revolution, many Soviet soldiers hesitated; despite what their commanders had told them, it seemed implausible that Amin, the leader of the PDPA government, was an American double agent. Despite several objections, the plan to assassinate Amin went ahead. Before resorting to killing Amin by brute force, the Soviets had tried to poison as early as 13 December (but nearly killed his nephew instead) and to kill him with a sniper shot on his way to work (this proved impossible as the Afghans had improved their security measures). They even tried to poison Amin just hours before the assault on the Presidential Palace on 27 December. Amin had organised a lunch for party members to show guests his palace and to celebrate Ghulam Dastagir Panjsheri's return from Moscow. Panjsheri's return improved the mood even further; he boasted that the Soviet divisions had already crossed the border, and that he and Gromyko always kept in contact with each other. During the meal, Amin and several of his guests lost consciousness as they had been poisoned. Luckily for Amin, but unfortunately for the Soviets, he survived his encounter with death, because the carbonation of the Coca-Cola he was drinking diluted the toxic agent. Mikhail Talybov, a KGB agent, was given responsibility for the poisonings. The assault on the palace began shortly afterward. During the attack Amin still believed the Soviet Union was on his side, and told his adjutant, "The Soviets will help us". The adjutant replied that it was the Soviets who were attacking them; Amin initially replied that this was a lie. Only after he tried but failed to contact the Chief of the General Staff, he muttered, "I guessed it. It's all true". There are various accounts of how Amin died, but the exact details have never been confirmed. Amin was either killed by a deliberate attack or died by a "random burst of fire". Amin's son was fatally wounded and died shortly after. His daughter was wounded, but survived. It was Gulabzoy who had been given orders to kill Amin and Watanjar who later confirmed his death. The men of Amin's family were all executed, while the women including his daughter were imprisoned at Pul-e-Charkhi prison until being released by President Najibullah in early 1992. After Amin's death on 27 December 1979, Radio Kabul broadcast Babrak Karmal's pre-recorded speech to the Afghan people, saying: "Today the torture machine of Amin has been smashed". Karmal was installed by the Soviets as the new president, while the Soviet Army began its intervention in Afghanistan that would last for nine years. ^ "Hafizullah Amin". Encyclopædia Britannica. ^ Misdaq 2006, p. 136. ^ "Library of Congress / Federal Research Division / Country Studies / Area Handbook Series / Afghanistan". www.country-data.com. ^ a b Arnold 1983, p. 80. ^ Jessup 1983, p. 20. ^ a b Misdaq 2006, p. 110. ^ Arnold 1983, pp. 80–81. ^ a b c d Arnold 1983, p. 81. ^ Saikal, Farhadi & Nourzhanov 2006, p. 163. ^ Male 1982, p. 48. ^ Male 1982, p. 49. ^ Male 1982, p. 53. ^ Male 1982, pp. 53–54. ^ Male 1982, p. 54. ^ Male 1982, p. 55. ^ Male 1982, p. 56. ^ Male 1982, p. 57. ^ a b c Male 1982, p. 58. ^ Male 1982, pp. 58–59. ^ Arnold 1983, p. 52. ^ Arnold 1983, p. 53. ^ a b Male 1982, p. 62. ^ Male 1982, p. 63. ^ Rasanayagam 2005, p. 73. ^ Isby 1986, p. 6. ^ a b Male 1982, pp. 163–164. ^ a b Male 1982, p. 164. ^ Male 1982, pp. 164–165. ^ Adamec 2011, pp. li–lii. ^ Male 1982, p. 165. ^ Male 1982, pp. 165–166. ^ Male 1982, p. 166. ^ Male 1982, pp. 166–167. ^ a b Male 1982, p. 167. ^ Male 1982, p. 171. ^ Male 1982, p. 177. ^ a b Male 1982, p. 178. ^ Male 1982, p. 179. ^ Male 1982, p. 180. ^ Rasanayagam 2005, pp. 71–73. ^ Brecher & Wilkenfeld 1997, p. 357. ^ H. Kakar & M. Kakar 1997, p. 36. ^ Wahab & Youngerman 2007, p. 150. ^ Male 1982, p. 184. ^ a b Male 1982, p. 185. ^ Misdaq 2006, p. 125. ^ Tripathi & Falk 2010, p. 48. ^ Gladstone 2001, p. 118. ^ Male 1982, p. 192. ^ Amtstutz 1994, p. 273. ^ a b c Tomsen 2011, p. 160. ^ Tomsen 2011, pp. 160–161. ^ Tomsen 2011, p. 159. ^ a b Male 1982, p. 183. ^ Rasanayagam 2005, p. 87. ^ a b Rasanayagam 2005, p. 89. ^ Rasanayagam 2005, pp. 89–90. ^ Rasanayagam 2005, p. 90. ^ "Afghanistan Fiasco - HistoryNet". www.historynet.com. ^ Tripathi & Falk 2010, p. 50. ^ Tripathi & Falk 2010, pp. 50–51. ^ Tomsen 2011, p. 162. ^ Tomsen 2011, pp. 162–163. ^ "The Soviet Occupation of Afghanistan". PBS NewsHour. Retrieved 2018-03-27. ^ Tripathi & Falk 2010, p. 54. ^ Tripathi & Falk 2010, p. 55. ^ Camp 2012, pp. 12–13. ^ Garthoff 1994, p. 1009. ^ Braithwaite 2011, p. 87. ^ Braithwaite 2011, p. 86. ^ a b c Braithwaite 2011, p. 89. ^ a b c Braithwaite & 2011, p. 94. ^ Baker, Peter (2019-01-29). "Why Did Soviets Invade Afghanistan? Documents Offer History Lesson for Trump". The New York Times. ISSN 0362-4331. Retrieved 2019-01-31. ^ Braithwaite & 2011, p. 95. ^ a b c d Braithwaite & 2011, p. 99. ^ Braithwaite 2011, p. 103. ^ "VOL. XVII NO. 2". Kabul New Times. 2 January 1980. Jessup, John (1983). An Encyclopedic Dictionary of Conflict and Conflict Resolution, 1945–1996. Hoover Press. ISBN 978-0-313-28112-9. Saikal, Amin; Farhadi, Ravan; Nourzhanov, Kirill (2006). Modern Afghanistan: A History of Struggle and Survival. I.B.Tauris. ISBN 978-1-84511-316-2. This page is based on the Wikipedia article Hafizullah Amin; it is used under the Creative Commons Attribution-ShareAlike 3.0 Unported License (CC-BY-SA). You may redistribute it, verbatim or modified, providing that you comply with the terms of the CC-BY-SA.